"A Little Prayer of Thanks"
I didn't actually plan on hunting this particular farm. I had driven up to Gentry County back over Labor Day to scout the property. We jumped some deer but the farm was mostly just a big corn field. 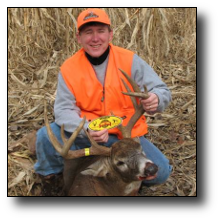 I was fearful that it would be difficult to hunt if the corn wasn't harvested before the deer season began. I thought about it for several days and decided that maybe I should ask Angie to find me another place. I talked to her and she came up with another farm. I looked over the satellite maps and it looked decent, but I never actually had a chance to go up there and check it out in person...until Friday, the day before rifle season opened. (Nothing like waiting until the last minute!) So, at 10 minutes until 5:00 P.M., I called Angie and asked her if I could have the other farm back. She kept me in suspense for a few minutes but eventually came back and said that the farm was still available. So she switched me back. Sunday morning I went to my stand. It was cold and there was a slight wind but it wasn't as bad as the day before. About 7:45 A.M., I heard something rustling in the leaves, turned my head and saw the nicest looking buck that I'd ever seen walking towards me. He wasn't chasing a doe. He seemed to just simply be foraging for acorns. (I was hunting between the standing corn and a small wooded draw.) The buck came walking up the middle of the draw. He stopped about 40 yards from my stand and stuck his nose up in the air, testing the scent around him. Smelling nothing suspicious, he continued to come closer. Finally, when he was 20 yards..."yes, 20 yards below me," he actually looked up at me. We made eye contact. I wasn't moving a muscle but I couldn't control my fast rate of breathing. It was cold so every breath I exhaled looked like chimney smoke. He looked at me for a few seconds and then just went back to foraging on the ground. I decided I had tempted fate long enough. I shot. After the shot, I could tell that he was hurt but I had no idea how tough this deer was going to be. He trotted up the hill about 80 yards and stopped. I could tell he was unstable but he kept moving. I had him in my sights a second time but I felt in my heart that he was hurt bad and he couldn't go much further. I was wrong...shortly thereafter, he disappeared back into the draw and I couldn't see him any longer. I called my brother-in-law, who I was hunting with and told him what had just happened. I told him I was going to wait about 15 minutes and then I was going to get down and start looking for him. I didn't wait 15 minutes! I just couldn't stand not knowing. So I got down and walked over to where I shot. There was no blood. I walked up the hill, following the path the buck took. Still no blood! By this time, I'm in panic mode. All I could think was..."I've blown it." "The best buck of my entire life and I've blown it." "I should have shot again!" Well...fortunately, when I made it to the top of the little knoll where the buck last stood, I looked down and finally found a leaf with some blood. That renewed my hope. When I started into the wooded draw, I saw nothing on the ground. The draw was essentially a big ditch so I was hopeful when I got the bottom of the draw and inspected the ditch, I would find my deer. But when I got to the bottom, I walked about 75 yards in both directions and still no sign of blood and no sign of the deer! I'm not even going to tell you what was going through my mind by that time, other than to say that I was getting sick to my stomach. But thankfully...when I stepped out of the ditch and into the next corn field, I looked down in the corner of the field and I saw "horns sticking up." To be completely honest, I had no idea just how nice he was until I actually walked up on him. I said "a little prayer of thanks," and called my brother-in-law to let him know that I found him. Hours later while inspecting the buck, we discovered that my .30-06 had penetrated his front shoulder but did not exit. We felt that was the reason he didn't bleed much. Nevertheless, it amazes me that I shot the buck at 20 yards with a 150 grain Winchester .30-06 and it didn't go all the way through. What's even more amazing is that we estimated the buck went about 400 yards from where I initially shot him. So, needless to say, I was extremely happy with how it turned out. My brother-in-law was happy for me as well, but after helping me drag the buck back to the truck, he informed me that I owed him a steak dinner, which I gratefully complied with later that evening. It was a great hunt and a great time. Thanks HSP for the opportunity. Bigger thanks though to Angie! As far as the size of the buck, I don't know much right now. I do intend to get him scored but based upon several folks who saw the deer later that evening, most folks seem to be of the opinion that he would score around the 150's. 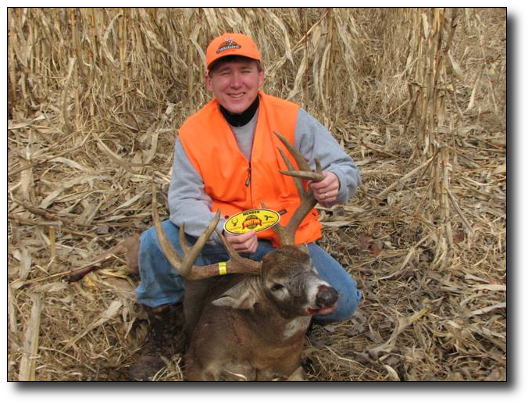 He was a 10 pointer and we guessed that he went 200 pounds field dressed.